Celebrate your little princess’s birthday with the Pink Princess Double Lane Combo Bounce House! At 28 x 15 x 15, this bouncy castle offers a lot of room for bouncing and playing. Bright pink and designed like a castle, this bouncy house is perfect for the girly girl in your life. This inflatable bouncy requires a 35 x 25 area for setup. If you have a girl who loves to play dress-up and always chooses pink over every other color, then this is the bounce house and slide for her. 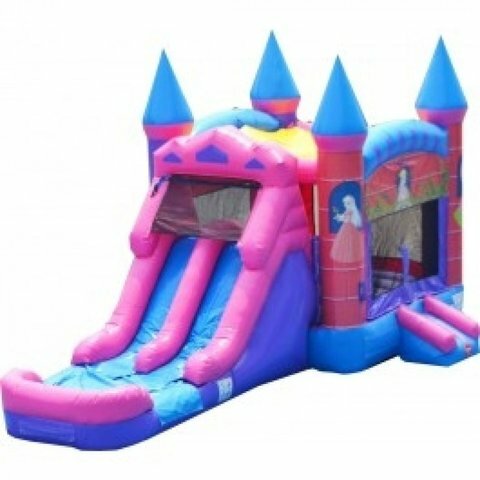 The Pink Princess Double Lane Bounce House Slide Combo was designed in the shape of a princess's castle and features spires on the corner pillars. The inflatable has vibrant pink and purple colors and a colorful graphic over the entrance. The three-foot ramp makes for easy entrance into the bounce house. Reserve the Pink Princess Combo Bounce house for your little girl’s birthday party today!